Job design is a significant aspect in any organization. It is aimed at enhancing job satisfaction, improving quality, as well as reducing employee issues (Hellriegel & Slocum, 2010). 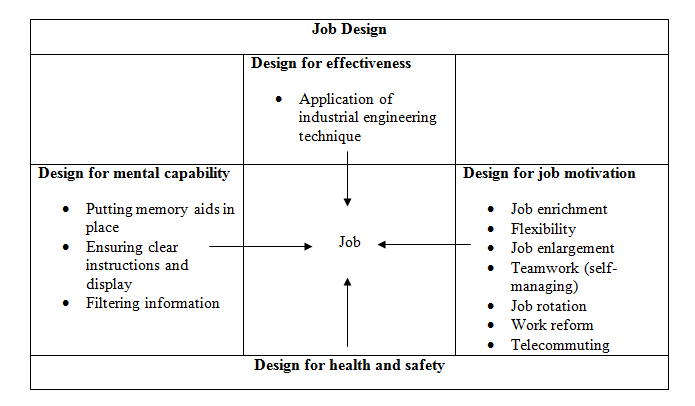 Job design entails the manner in which methods, contents and job relationships are arranged for the purpose of satisfying organizational, personal and technological requirements (Champoux, 2010). There are various ways in which a job can be designed. As Dunkin Donuts’ new district manager, formulating and implementing an effective job design is paramount in ensuring high performance. For Dunkin Donuts, the job design stresses on a number of aspects which include the mechanics of executing a job in an efficient way, the effect of the job on employee motivation, mental demands, as well as ensuring safety in the workplace. The structure of job design to be adopted at Dunkin Donuts is shown in the figure below. Hackman and Oldham’s Job Characteristic Model would be employed in order to enhance job motivation. The characteristics illustrated by the model include task identity, autonomy, skills variety, task significance and feedback (Hellriegel & Slocum, 2010). They enhance satisfaction, productivity and effectiveness. Work organization is one aspect of job design that has to be used at Dunkin Donuts. It entails such elements as substituting and reorganizing work. It is achieved through workgroups, automating and division of labor. Another element is job rotation, in which staff creatively organizes itself and operate in diverse organizational levels. Performing different responsibilities is significant in helping employees boost their capacity in assessing their abilities (Champoux, 2010). Job enlargement is the last element. In this, employees would be allowed to establish their speed (which is within certain limits), to act as their own overseers and to design a method of their preference. Another aspect of job design is job structuring. It entails giving employees control or autonomy over their job. It also involves job enrichment whereby employees are given responsibility at diverse work levels. Some of the job characteristics to be considered encompass variety, autonomy, career path, provision of socially and intrinsically meaningful work, responsibility and acknowledgement of results. Organization design is a process in which structure, rewards systems, processes and employees are aligned with the business strategy (Hellriegel & Slocum, 2010). The purpose is creating an efficient organization by improving communication and employees’ productivity. Dunkin Donuts’ new district manager will have a responsibility of defining organizational needs and then creating systems for the purpose of meeting such needs in an effective way. Systems are intended to promote decision making and employee responsibility. The Galbraith’s Star Model of organizational design has been applied in this case. Strategy creation is the initial aspect while devising an organizational design. Strategy, in this case, focuses on vision, governance and comparative advantage. It is derived from the fundamental philosophy of the organization and aims at directing employees towards activities formulated to attain the purpose and preferred results. Through technology, employee capabilities would be improved in order to attain meaningful work. The second aspect is an organizational structure (Champoux, 2010). The structure of Dunkin Donuts is hierarchical in nature. The organization has top-level executives (including managers and supervisors) and bottom level executives. The responsibility of top executives is to ensure an effective flow of information and organizational roles are given to employees with regard to their skills and capability. Such roles are organized in departments, including production, accounting, human resource and marketing among others. The human resource management (HRM) would be responsible for hiring, providing work feedback to employees and making sure that the process of learning continuous. In addition to improving motivation, knowledge and skills for employees would also be amplified (Champoux, 2010). The reward system, which entails providing compensation and rewards to employees would also be incorporated. It matches with the skills, roles and the position of employees. Recruitment and selection form an integral part of the underlying activities of human resource management, including the acquisition, development and compensation of employees. Recruitment and selection decisions are undertaken by line managers. The human resource manager plays a supporting role to the line managers, who are also responsible for working with the new employee. Recruitment has been defined as the process of determining that an organization requires new personnel. Selection, on the other hand, refers to the processes involved in choosing the right candidate to fill the position of the applicants. Recruitment and selection play an important role in ensuring employee performance and affirmative organizational outcomes. Studies indicate that recruitment and selection is done to employ workers who can perform at high levels and exhibit commitment (Champoux, 2010). In the case of Dunkin Donuts, the human resources manager will have the responsibility of conducting recruitment and selection, because he is responsible for the organization’s effectiveness and performance. As the new district manager, it will be necessary for him to ensure that the HR manager recruits employees who already acquire the right knowledge, aptitudes and skills, as well as those who can make a precise prediction on their projected abilities. Besides, it has to be ensured that the HR manager carries out the exercise in a manner to reduce undesirable costs, such as the ones linked to high employee turnover, dissatisfied clientele and poor performance. Dunkin Donuts’ HR manager will have the responsibility of cultivating a mutually beneficial employment relationship described by high commitments. Training comprises of a number of processes meant to ensure that employees have the relevant knowledge, skills and attitudes necessary to help and organization acquire its goals and objectives (Gilmore & Williams, 2009). Dunkin Donuts’ HR manager will be mandated with the formulation of training policies. The HR manager will be required to formulate training policies that uphold the goals and objectives of Dunkin Donuts. The policies should ensure that obsolescence is prevented, both the new and old employees meet the requirements of the company, employees are prepared for heavy tasks and there is an economic output of requisite quality (Gilmore & Williams, 2009). Training is either done using the traditional or new methods. The methods are further categorized into on-the-job off-the-job training programs. Dunkin Donuts will use the job training or instructional training to teach its employees new skills. Such method helps employ workers on a regular job and ensure that they are taught the required skills necessary for job performance. The job of the district manager, in such case, will be to ensure the employees learn under an instructor. Dunkin Donuts chooses to use on-the-job training as it gives the employees first-hand knowledge and experience under the definite working conditions. As the employee learns how to perform the job, he still continues to render the services for which he is assigned. On-the-job training methods include coaching, step-by-step training, and job rotation and job instruction (Gilmore & Williams, 2009). Performance appraisal, on the other hand, is a systematic way of evaluating an employee’s performance during a given period of time, as well as planning for his future. Performance appraisal is a powerful tool to refine, calibrate and reward employee’s performance. The tool helps analyze an employees’ achievements and assess their contribution towards the achievements of organizational goals. Performance appraisals focus the attention on personnel management (Gilmore & Williams, 2009). Additionally, it reflects the interest of the management on the progress of the employees. The aim of conducting performance appraisals is to review an employee’s performance over a period of time, strengthen a relationship and enhance communication between the superior, subordinates, management and employees, exercise organizational control, analyze the strength and weaknesses of workers and provide feedback on their previous performance. Lastly, performance appraisals are meant to review the effectiveness of an organization’s human resource functions, such as recruitment and selection. There are various methods used to appraise employees. They include critical incidents methods, field review, checklist method and straight ranking method (Gilmore & Williams, 2009). Dunkin Donuts will use the critical incident method to appraise its employees. In this method, the assessor rates the workers on the basis of an incident and how they behaved or responded to the incident. The method includes both positive and negative points. A shortcoming of such a method is that the supervisor has to control and take note of every incident and employee behavior towards the incidents as they occur. As it has been noted, employers and/or managers need to properly plan before employing a staff for a company. Besides, the evaluation of the employed staff is equally important. 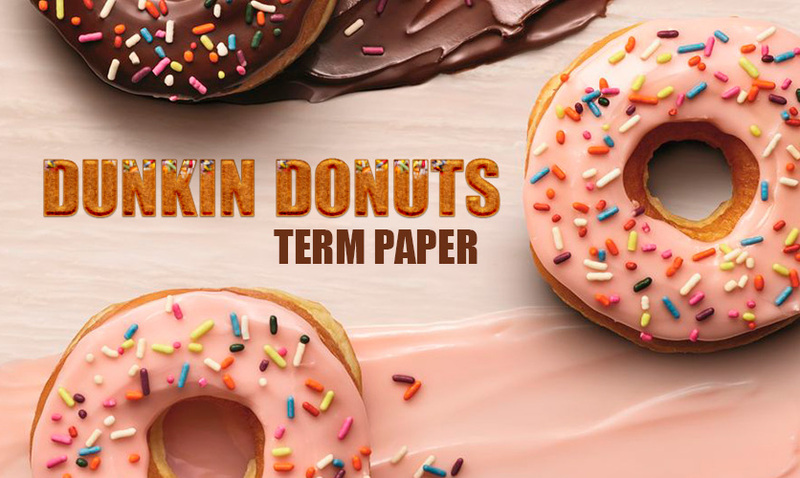 The paper has encompassed the job design, organizational design, recruiting and selection and training and performance appraisals to be used by the new district manager of Dunkin Donuts in the new premises the company intends to open.